Cleansing - Even with washing your face color hold for 3 days * , no eyebrow disappear! 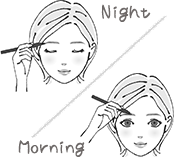 2 types of eyebrows come true with one, the birth of high Cospa Eyebrow! * When applying liquid tint for 3 consecutive days, it lasts about 3 days thereafter. It is recommended for such a scene! Easy! Fail to know with tint type to draw! Dye settled in 6 hours. Even at Suzin, Nachu's eyebrows continue! "Liquid tint" x "Fluffy powder"
Two types of Imadoki eyebrows are completed with one! Eyelash essence "Rush Serum series"
beauty ingredients * included. While caring, it is beautiful! A Line With Draw Liquid Tint According To Your Favorite Eyebrow Shape. Color Settled In 6 Hours. If You Overwrite It You Can Adjust The Density! Easy · short time as the base is made with tint! Just blur the missing parts with powder and finish!l differences in sustainable effects.